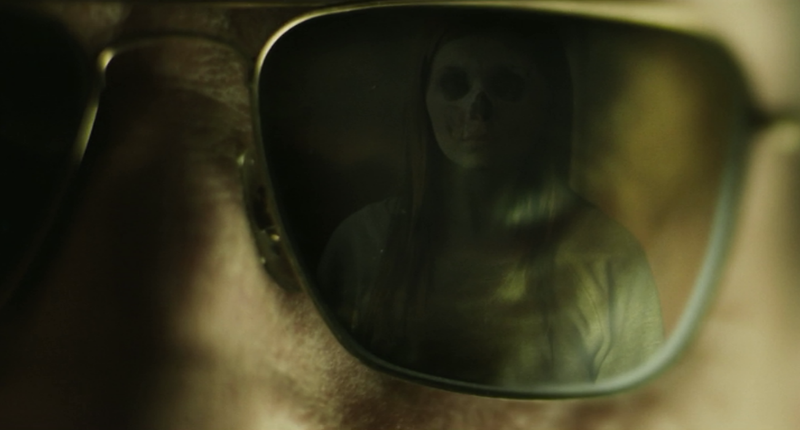 This ghost story from Cube and Splice director Vincenzo Natali takes place in four different time periods ranging from the 1920s to the present – each with a distinct look – and shifts between reality and a fog-encased spectral limbo. The man charged with creating those looks is Canadian (by way of South Africa) cinematographer Jon Joffin, ASC, who talked to Deep Fried Movies about shepherding his director into the digital realm, Haunter’s art-house inspirations and choosing the Arri Alexa over Sony’s F65. The Plot: Haunter begins as a phantasmagoric variation on Groundhog Day as teen Abigail Breslin wakes up each day and re-lives the same routine – do the laundry, practice the clarinet, meatloaf for dinner, watch Murder She Wrote with her family, repeat ad infinitum. 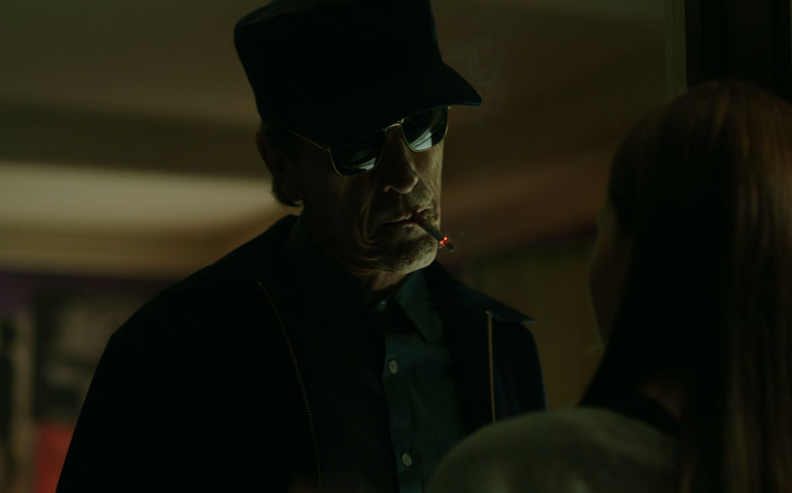 The story shifts into the vicinity of supernatural mystery as Breslin unravels the truth behind her perpetually fog-enshrouded house and the skeletal man (Pontypool’s Stephen McHattie) intent on keeping her there. Talk a little bit about your relationship with movies growing up. I actually came from a stills photography background. My dad was a stills photographer and he passed on his love of still photography to me. When I was around 11 years old he taught me how to use the darkroom. The interesting part was we didn’t have TV growing up because I lived in South Africa. It didn’t really come to South Africa until I think I was 13. So the cool thing, instead of a video rental store, we had a 16mm movie store you’d go to. We had our own little 16mm projector and once a week, like on a Friday night, neighbors would come over and we’d watch TV shows or movies on (16mm) film. Did your dad have a particular camera you always wanted to get your hands on? He had a Rollei 2 ¼, which was a twin-lens reflex camera. That was the one I wanted to use all the time. (Not long after I started taking pictures) I was allowed to use that, which was pretty cool. It was a square format (aspect ratio) – so it was anti-anamorphic. 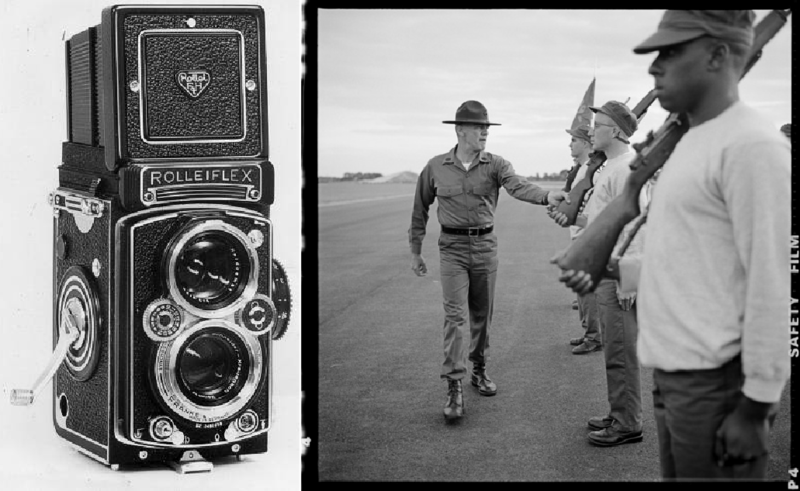 (Below) An example of a Rolleiflex twin-lens reflex (left) and the camera’s “anti-anamorphic” format (right) via a photo taken by actor Matthew Modine with a Rolleiflex 2 1/4 during the filming of 1987’s Full Metal Jacket. When did you get a chance to start catching up on all of the cinema history you missed out on in South Africa? We moved to Toronto when I was 13 and I know this is going to sound crazy, but there were 30 channels and that just blew my mind. That’s where I caught up on a lot of movies and I started going to movies too. I remember buying tickets in advance to see Apocalypse Now. That one blew me away. I gobbled everything up. We’d stay up as late as we could watching shows and movies on TV. We just loved that stuff. Not any genre in particular. I loved it all. I would watch anything. Let’s get into Haunter and working with Vincenzo Natali. Natali started as an animator and also worked as a storyboard artist. What was it like collaborating with a filmmaker with such a specific sense of what he wants visually before production even starts? It was great because when he was describing a shot to you, he’d say “like this” and he’d just pick up his pen or his iPad and he would scribble it out for me so I could quickly see what he wanted to do. Yeah, he storyboarded the hell out of that movie. The only enemy on that movie was just having enough time to get everything because he was so particular about what he wanted and we had a very short time to shoot that movie. This is Natali’s first movie not shot on film and also his lowest budget since 1998’s Cube. Was the move to digital predicated by anything other than budget? I think just because of the budget, he had to (go digital). There was no choice really. We needed the money to build sets and to pay actors and to feed the crew and stuff like that. So there was no question we were going to go digital, but he was a little bit nervous. 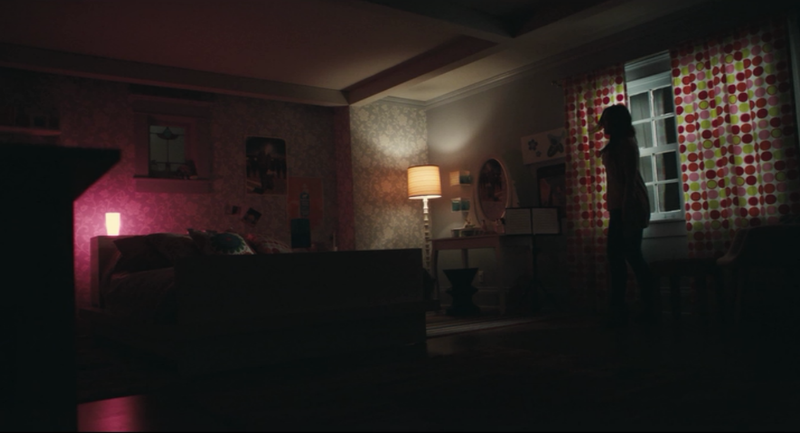 He had seen a movie that I did called Daydream Nation and he really liked the look of it and it was shot on a Sony F35 and it had a very film-y kind of a look to it. I think he was quite impressed with that and that’s how we first met. He knew the director (of Daydream Nation) well and he loved the movie. But he was definitely nervous about shooting digital so we tested different cameras. He got used to it really fast. And that’s what happens. Directors, they fight digital, but then they’re sitting in front of that big, 23-inch monitor and they’re looking at pretty much what the show is going to look like when it’s done and they’re able to roll as long as they want. There’s no subterfuge (with digital). (Natali) knew exactly what he was getting. So he knew how dark something was going to be and that was actually really good because on (Haunter) we went pretty dark. 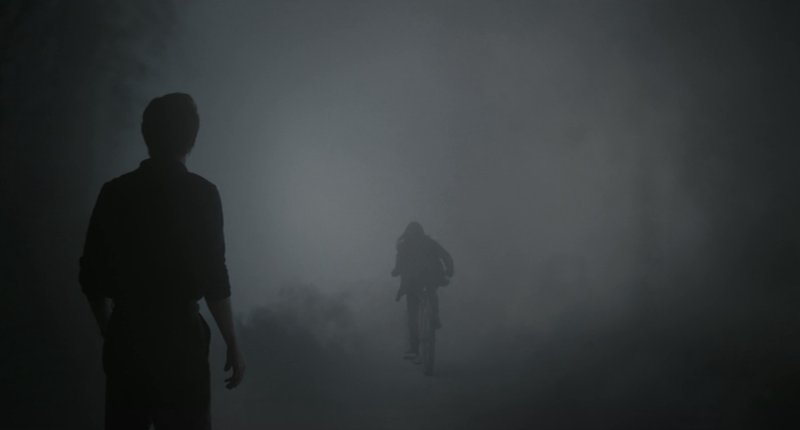 Because no actual gore happens, we really wanted this terrifying and ominous feeling and we wanted people to be tense all the time so darkness was definitely our friend. Though Haunter is a ghost story, the list of references that Natali has talked about in interviews doesn’t include many horror films. 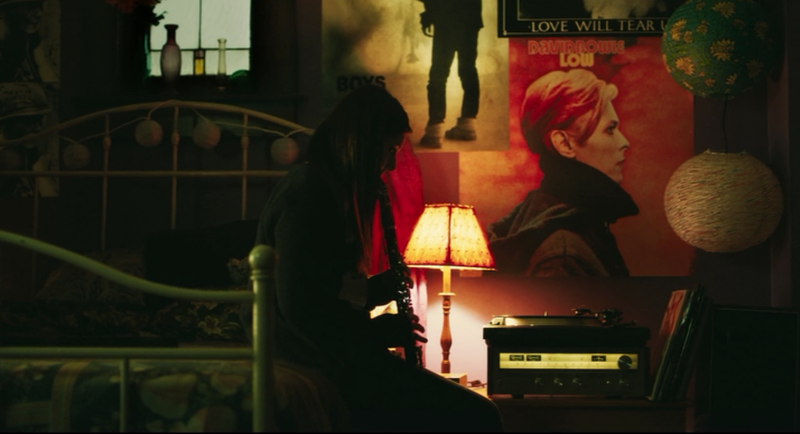 Instead, it’s everything from Ingmar Bergman’s Persona to John Hughes’ 1980s output. What were some of the films he wanted you to check out? He wanted me to watch (Federico Fellini’s) Juliet of the Spirits, which I hadn’t seen since film school. And the other big reference was Persona. We did watch some horror movies. I remember he made me watch, and I’m very open to watching whatever, but we were watching these movies by (Czech director) Jan Svankmajer. They’re very odd. And I was like, “I don’t understand why we’re watching these.” (laughs) Just very bizarre stuff. You know the scene in Haunter where (Breslin) goes down into the basement into that (secret) tunnel and there’s (ankle-high) water? It was a scene he showed me from a Svankmajer movie that we used as a reference. You shot the film with an Arri Alexa. What were some factors involved in that decision? We originally were going to shoot with the (Sony) F65. It had just come out and I think there was one other movie that was shooting with it (the Tom Cruise vehicle Oblivion). I had a relationship with this camera company Dazmo and we were getting our gear from them. They had just gotten an F65 and they were really keen to get it out there on a show. So I was really excited about it because, in theory, it shoots like true 8K and true 6K. With that camera you don’t have a choice, you have to shoot raw. So we were really excited about using that camera. We got it out there and we decided to test it against the Alexa and I just found that the Alexa blew it away in terms of latitude and feeling really film-y. We put them side by side, and the Alexa footage just looked so much nicer. The other thing too about the Alexa is that it just works. If you’re shooting out of town with a camera where you don’t have a backup, I just feel good about it because it just works. It doesn’t go down. It’s simple. I love the Alexa. It’s a great camera. No, we shot Log-C ProRes444. There’s this DIT that I work with (Jasper Vrakking) that I’ve done a lot of movies with and he actually lives in Toronto so it was perfect and he came on to do the film. I definitely don’t want to be color correcting and wasting too much time because you just have so little time on set, but he would just give me a basic LUT. He was running DaVinci Resolve on set so he could feed that back to me. 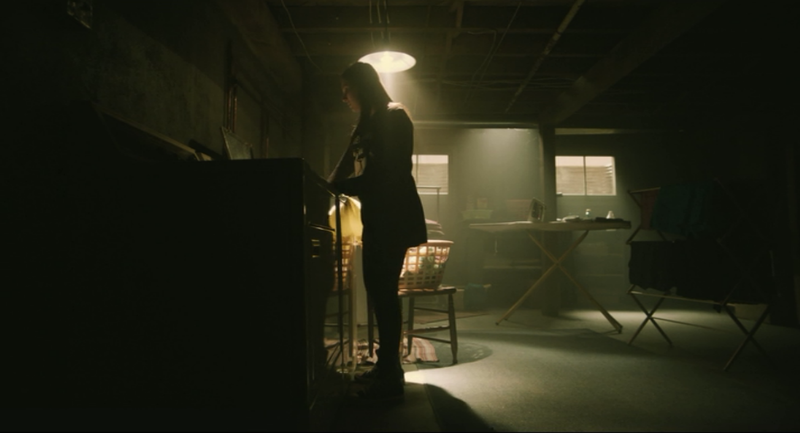 The one thing I did on that show, because there’s so much darkness and there’s so much black, I wanted the Alexa look but I wanted those super clean blacks (like a RED Epic provides). I didn’t ever want that grainy, noisy kind of thing. So what I did was I had (Jasper) build LUTs that would make everything two or three times as dark (as the image we were exposing for). Basically, I was giving the image way more light than it needed so we weren’t shooting at the bottom end of the sensor and then we crushed it down with the LUT so when we were sitting on set Vincenzo and I could kind of tell what we were going to have in the end. (Above) Breslin’s bedroom in the 1980s portion of Haunter (top) and during the contemporary scenes in the same location (bottom). Though most of Haunter is set in a dream-like version of the 1980s, the movie also hops around in time to the 1920s, 1950s and into a contemporary time period. How did you visually differentiate those eras. For the 1980s look, because it was foggy outside the windows, I tried to make it feel like light was always coming from the window or coming from practicals. I tried not to use backlight. I tried to just light naturally from the side with very soft light. Then in the present day, we blasted harsh, slightly cold light through the windows. Even though it was harsh light coming in, we used soft light bouncing into the (actors’) faces. I love to do soft lighting, but in a contrasty and controlled way. (Below) The drastically different looks for the kitchen in the 1980s (top) and contemporary (bottom) scenes of Haunter. 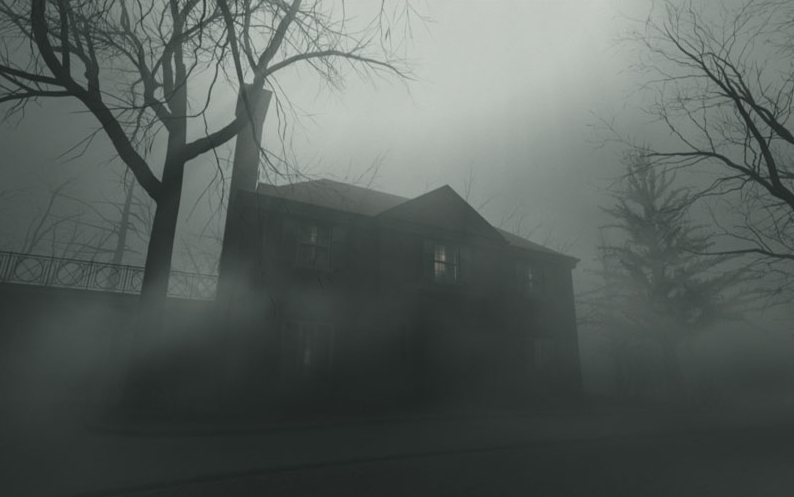 Below, Joffin walks us through a few shots from Haunter. Breslin searches for clues in the attic. We wanted the attic to feel – even though there was a bright light in the center – we still wanted it to feel kind of dark so I let (the light) fall off (around the edges). Color-wise, it was a kind of brownish green color, which was offset a little by the blue from the TV. McHattie arrives at the house for the first time. My instinct was to make it really dark when (McHattie) showed up. But (Natali) said if any scene was going to be bright in the movie, this should be the brightest scene because he wanted to play the terror of this guy against the brightness of the day. I think that worked very well too. When you first see him outside and he almost looks like a skeleton, sort of out of focus, I thought that was really cool. (Vincenzo) had really great ideas. He’s a great filmmaker and a great guy to work with too. 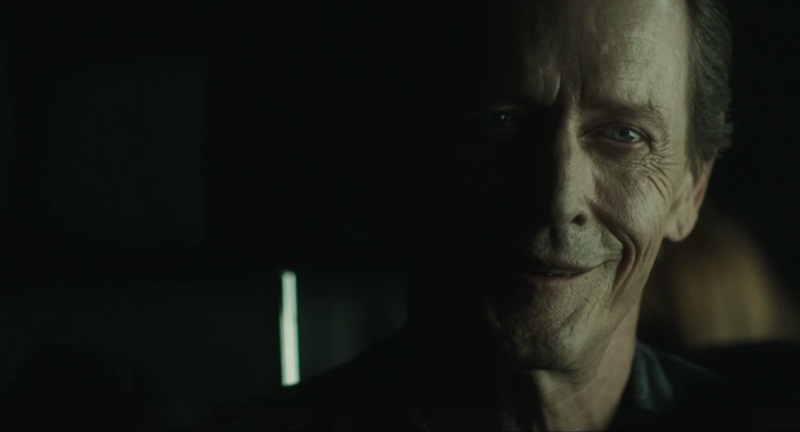 Then after (McHattie) threatens (Breslin), at that point you know that he’s pretty evil and from then on I felt like I wanted to light him very dark and very sinister. 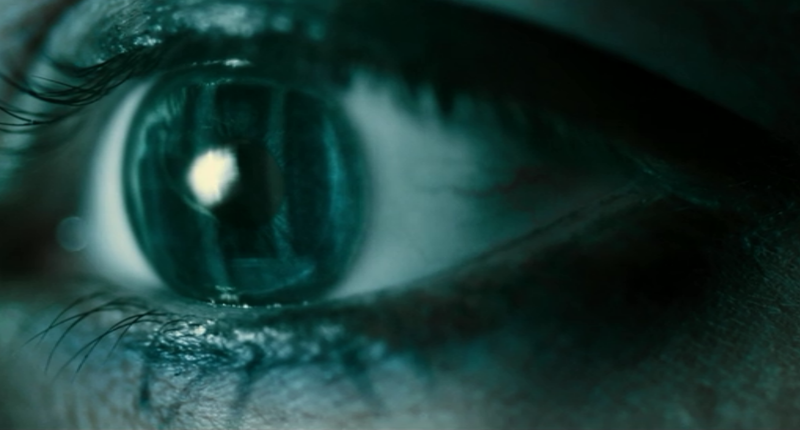 One of Haunter’s multitude of extreme close-ups of its casts’ peepers. We tested all kinds of things, all kinds of macro lenses, and then we found out that the closest we could get was using a 24-290mm zoom and we put a lens extender on it, which made it more in the 48-600mm kind of range. Then we got these diopters to be able to focus more close-up. We used this super thick glass. Normally diopters look just like little filters, but these were like an inch thick glass. They’re called achromatic diopters and we found that they gave us the best results. We did a lot of testing in prep. I remember the crew was all shooting our own eyeballs to see what they looked like. What was the depth of field on a lens that long? Half an inch? 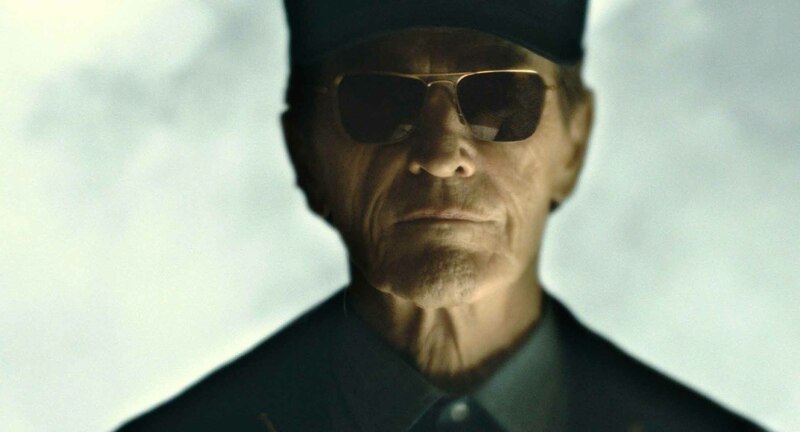 Could the actor move at all without the eye going out of focus? Oh, not even half an inch, more like half a millimeter. Those shots were very specific and quite often we wouldn’t even shoot them when we were shooting the scene. It was done afterwards. And another thing is, you need a heck of a lot of light because you’re losing a lot of light (by using the lens extender). Whereas most of the film, because I like the soft focus look, most of it is shot at around a T2, but (for the eye shots) we needed to be at a T16 or 22 in order to get the little bit of depth that we had. Joffin has spent more than 25 years working in production, including shooting a myriad of X-Files episodes and earning an Emmy nomination for his work on the 2008 A&E miniseries The Andromeda Strain. He was generous enough to spend a few extra minutes with Deep Fried Movies to talk about a handful of the many projects he’s been a part of. The Brain (1988), a Toronto-shot horror movie on which Joffin served as 1st Assistant Camera. 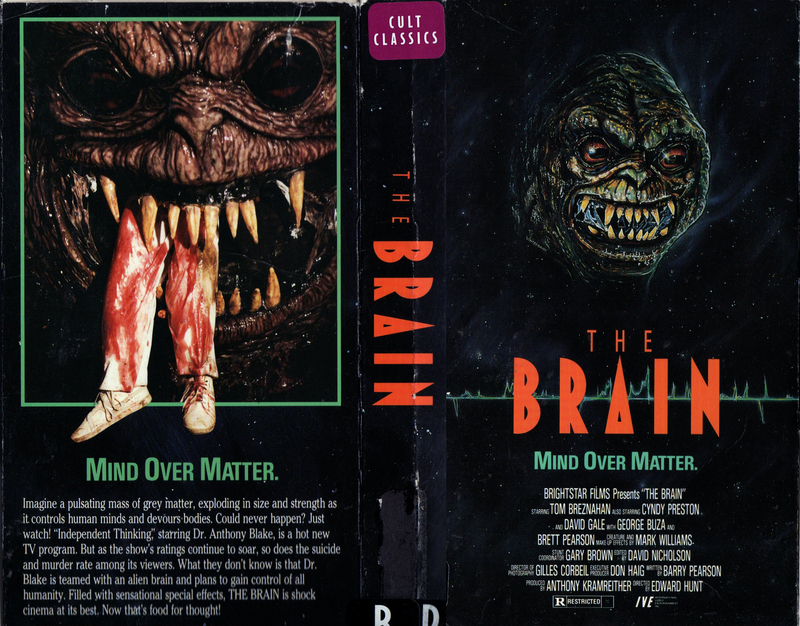 I’ve never actually seen The Brain, but its VHS cover is the stuff of legend. I remember telling Vincenzo about that movie. I don’t think I’ve ever seen the whole movie, either, but it starts off with a brain in a lab and it eats people and gets bigger and bigger and eventually it ended up being a (monster) suit with four people in this big suit walking around. But I remember the last day of shooting was the absolute longest day of my film career. We shot 33 hours, but we were young and we could handle it. It was so low budget. They just kept breaking us every six hours and giving us another meal and they thought that was fine. I don’t believe we got paid any differently (for that long day) than we did on any other day. Yeah, The Brain. That’s a classic. (Below) A Spanish trailer for The Brain. 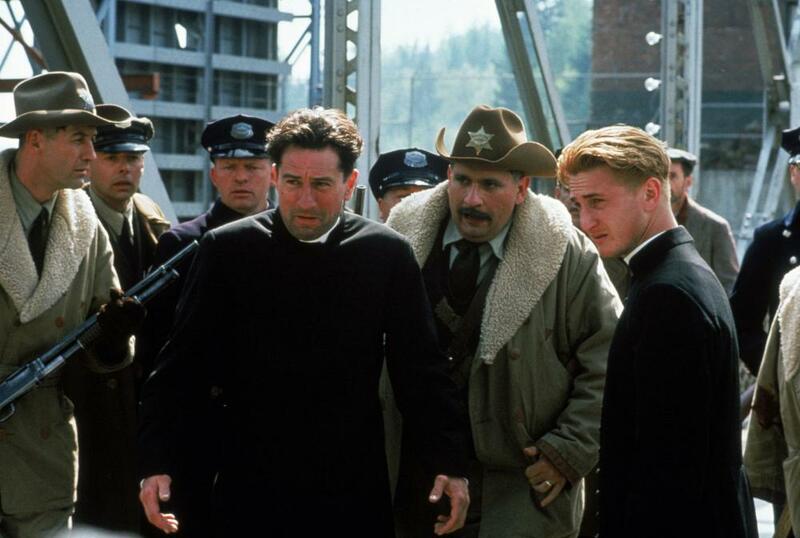 We’re No Angels (1989) – Robert De Niro and Sean Penn play a pair of escaped prisoners posing as priests in order to sneak into Canada is this period comedy directed by Neil Jordan and written by David Mamet. That was the best movie ever because it shot over a period of three or four months and we were basically paid to sit around. The film’s (story) took place over two or three days and I don’t know why but they chose to shoot that film in the summer (even though) it had to be overcast. So we were out at this beautiful location and, anytime it was sunny, we’d sit around with nothing to do. The one thing I do remember was the speech that Sean Penn gives at the end where he makes up this speech (during the procession of a holy shrine) and he bases it off of I think a pamphlet about guns. I just remember being on set and that speech was so good, I was so blown away by it, that just being there was super cool. You shot 10 episodes of the Showtime anthology series Masters of Horror. Do you have a favorite episode? A big thanks to Jon Joffin for walking Deep Fried Movies through the making of Haunter, which can now be found on VOD, DVD and however else you’re consuming your flicks these days. 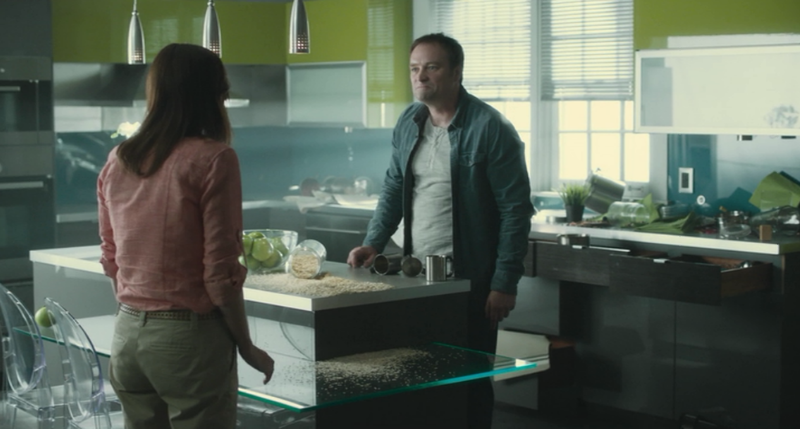 He also shot the upcoming SyFy pilot High Moon from Pushing Daisies and Hannibal creator Bryan Fuller. So check that out when it premieres. You can still easily track down 2010’s Daydream Nation as well starring Kat Dennings and Josh Lucas, a film Joffin says he’s very fond of. And somewhere, probably at a swap meet or flea market, there is a VHS copy of The Brain to be had for a buck.